In the "no strings attached" sweepstakes, a winner will be chosen weekly and posted on the Web site. Online jewelry retailer, http://www.Titanium-Jewelry.com has announced its Free Weekly Ring Giveaway, giving away one free ring every week beginning May 10, 2005. A winner will be chosen weekly, with their name posted on the website. 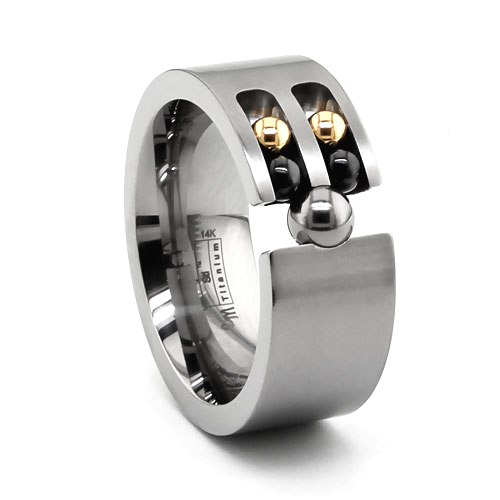 A "no strings attached" sweepstakes, absolutely no purchase required for sign-up at http://www.titanium-jewelry.com/sign-up.html. Ron Yates, founder of Titanium-Jewelry.com said, "We've only had the Free Weekly Ring Giveway for only a couple weeks now, but the feedback has been tremendous. It has helped create an exciting buzz and some great goodwill. Hopefully, the winners will spread the word." Each giveaway winner receives a $199 gift coupon towards the purchase of any ring on the http://www.Titanium-Jewelry.com Web site. The winner may purchase a ring for $199 or choose a more expensive ring and apply the gift coupon towards the purchase, with free shipping within the continental United States. Titanium-Jewelry.com offers the finest designer titanium rings and tungsten rings available. 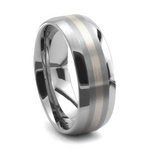 With a huge selection of titanium rings, titanium wedding bands, tension set rings and titanium jewelry, Titanium-Jewelry also features rings in patented black titanium and tungsten rings, the latest trend for wedding bands. Visit http://www.Titanium-Jewelry.com for more information or to register for the Free Weekly Ring Giveaway. From the Active Collection; wide titanium ring with rolling black onyx and 14kt gold balls. 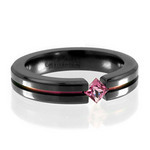 Black titanium ring with a tension set princess cut pink sapphire. The sapphire is set diagonally and the groove is pink annodized to match the stone color. Always polished Tungsten Carbide wedding band with 14kt white gold inlay.